The SoundKase keeps your smartphone safely attached to your arm while you run, bike, workout and more. 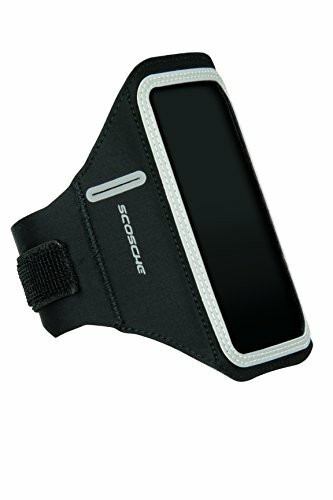 The adjustable neoprene armband comfortably fits small and large arms and is extremely lightweight. Openings allow for headphones and other cables to be plugged into your device while it stays protected. Neoprene material breathes well during strenuous exercises and fits comfortably around your arm. The SoundKase prevents you from having to carry your device or setting it down on workout equipment where it can be easily forgotten. A hook and loop strap secures the case as tight or loose as you would like. Built-in screen protection keeps the fragile glass on the front of your Smartphone from getting damaged. This screen protector allows you to fully operate your touchscreen controls while your device remains fully protected. Reflective accents let you run safely at night or in cloudy weather. An integrated key slot allows you to conveniently store small items while you workout.